Rooms 1 & 2 This is the largest open space in the Centre. It has a movable partition which can split the room in two. Chairs and tables can be set up for a meeting/ event or the space can be left free for a children's party or special occasion. 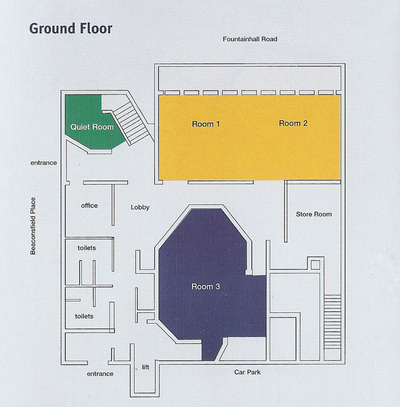 Room 3 A medium sized room which can also be set up with tables or chairs or left as an open space. The room is well suited to an evening group meeting on a regular basis. The room contains a small open plan kitchen area. The Quiet Room Located near the front door, this room contains the Church Library which can be used by all visitors to the Centre. The room can also be used for quiet meditation or prayer, or for occasional small meetings. 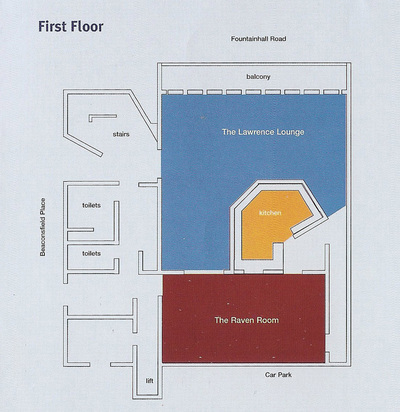 The Lawrence Lounge This is a large and attractively shaped room, overlooking Fountainhall Road. With lounge seats and low tables the room is well suited to a relaxed gathering. There are two serving hatches from the Kitchen. Suitable for up to 70 people. The Raven Room This has a solid beach floor to enhance the natural elegance and light of this room. Comfortable upright chairs and versatile tables are available which can be used for small groups or couples, or put together to form a large conference or meeting table. There is a serving hatch from the kitchen. The Lawrence Lounge and the Raven Room can be combined to provide an exceptional space for larger groups or a reception. The Kitchen A modern kitchen with a dishwasher, fridge, freezer, microwave and oven is available if required.